How long does a diatom cell live? Does the parent still exist? A single diatom cell can divide and form two new cells. Cells may divide as quickly as once a day up to once every several weeks. The silica cell wall is a sort of biological constraint, because with each cell division diatom cells become progressively smaller. 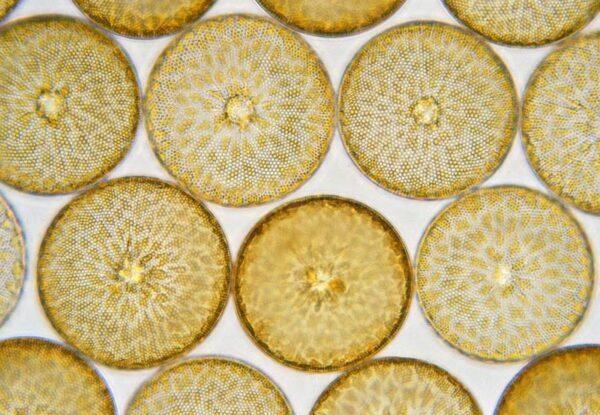 As a result, the older the diatom cell, the smaller it is. This is an interesting thing, that each daughter cell is smaller than the parent. The daughter cell forms a new silica cell wall inside the parent, but the rigid glass cell wall cannot expand. The baby is stuck, for its entire life, being smaller than the mom. Not only that, each daughter cell has one valve (half of a diatom cell) donated by the parent and one valve that is newly formed. So at this point, things get philosophical. If a parent diatom cell divides and gives one cell wall to one daughter and the other cell wall to the other daughter, does the parent still exist? Living diatoms cultured from the North Sea plankton.